J W YOUNG & SONS (FISHING REELS) LTD.
and flawless action that is a joy to use and cherish for a lifetime. 4.5” X 1.0 " quick release spool, manufactured in the UK by JW Young's reels. Inspired with the help of Bob James, a highly acclaimed UK fisherman and a "sort of a Fishing God" in the UK's fishing community.. 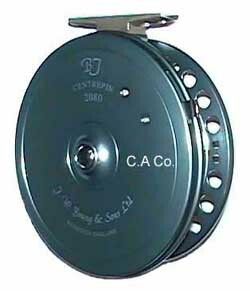 This centerpin reel features a low torque spool, ventilated barrel, dove-tall reel foot, all promoting extra lightness of the reel and keeping shoulder fatigue at bay. Each reel comes with serial number, certificate of authenticity, packed in a sheep skin lined canvas storage pouch and matte black box. 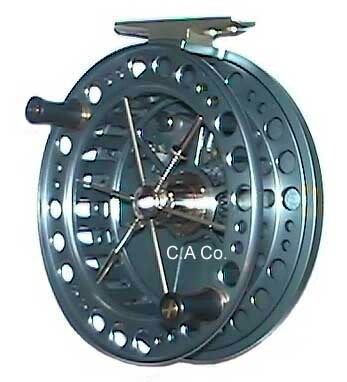 A reel favorite in the great lakes tributaries! Not the one you are looking for? we have more! - click the Center pin Reels link (left of this page ) to order!